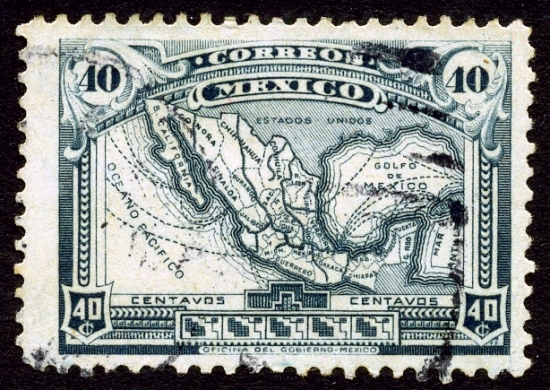 It was not until 1915, in the middle of the Mexican Revolution, that a map of the Republic appeared for the first time as the central design on a Mexican postage stamp. Most states were named, though abbreviations were necessary given the size of the stamp. In 1915, though, the state of Nayarit on the Pacific Coast, north-west of Colima did not yet exist. It came into being in1917, with the signing of Mexico’s Constitution (the one which is still currently in force). Baja California, shown as single entity on the map, was divided into northern and southern sections in 1931. In addition to the states, the map shows the main railway lines and also the main shipping routes. In 1915, the easiest way to reach the Yucatán Peninsula was by boat. It would be another 35 years or so before a rail link was completed between Veracuz and Merida. International shipping routes were very important in 1915, since air travel was in its infancy. The map take some artistic license with scale. In particular, the island of Cuba has been brought much closer to the north-eastern tip of the Yucatán Peninsula than it really is. The historical evolution of the boundaries of Mexico, and of its individual states, are analyzed in chapter 12, “The changing political map of Mexico” of Geo-Mexico: the geography and dynamics of modern Mexico. The development of Mexico”s railway lines is discussed in detail in chapter 17.